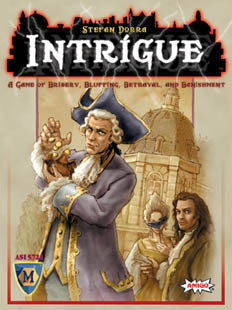 Intrigue - a secret scheme... To achieve or force a result by manipulation, scheming, or underhanded means. Can you supress your integrity and honor? Will only the money in your coffers have value to you? As master of a palace of unemployed scholars, you must coerce, cajole, con, bully, beg and bribe the other palace holders to employ these freeloading academics and bring you profit. Beware of double-crossing opponents, who may not honor your deals and banish your scholars to the "Island of Misfit Scholars". But revenge is sweet (and the profit that much greater) when they come to you for employment! Made in Germany, brought to you by the Mayfair Games and Amigo Spiele partnership.